February can be a challenge for faculty, as well as for students. The holidays are over, winter is gray, and spring break seems a long way off. There is one thing about February, though, that always brings me a new sense of energy. It’s Fulbright season. In February, students who are interested in applying for a Fulbright scholarship begin their journey toward their futures. 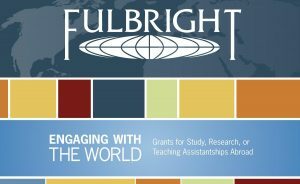 Fulbright Scholarships are part of a program funded by the U.S. State Department. The program has many elements, but the one that matters to Hope students is the U.S. Student Program, which sends recent graduates abroad for a year, to teach English, or to conduct research or a program of study in their academic areas of interest. The program is national and competitive, but Hope students have a history of doing well in the competition. Most students start in the spring of their junior year, choosing their potential host country and figuring out whether they want to teach, research, or study. Seniors sometimes start the program in the spring, but need to wait a year after graduation before their grants are awarded. We also work with Hope alumni who want to apply after having been out of college for a few years. There are three things I like best about Fulbright season. The first is the sense of infinite possibility. Students have all kinds of dreams about what they might do. A student of German decided to apply to teach English in Korea in order to expand her horizons. A student who had studied abroad in Cameroon devised a research project to take her back to Cameroon to study beekeeping. Another student, when faced with the lack of English teaching opportunities in sub-Saharan Africa, switched her interests to Nepal, and won an English teaching assistantship there. What will this year’s students choose to do? The second thing I like about Fulbright season is getting to know the applicants. Fulbright advising is a mixture of listening, asking questions, and editing. The applications require two short essays, and they are difficult to write. Applicants must compose essays that capture the essence of their personality, their preparation and their potential. All students have interesting stories and wonderful aspirations. It is difficult to articulate them, though, and sometimes we need to spend time talking about what is important to students, and about how they envision their futures. Sometimes, the most compelling stories emerge from the details of other stories. The first story we tell about ourselves is not always the most illuminating one, but it can be a gateway to an important and revealing narrative. Students need to tell stories that show themselves interacting with other people, and learning about themselves in the process. It is a privilege to be part of the students’ process of self-discovery. The third big reward of Fulbright season is observing the hard work and the growth of the applicants. They work very hard during the spring semester, and then continue to work on their applications over the summer. Most students revise their essays ten or more times. By they time they return to campus in the fall, they will have written applications that are ready to submit for nationally-competitive scholarships. During this process, students learn about writing, about persuasion, and about their own values. I am always inspired by the achievements and the growth of the applicants by the end of the application process. Of course, as happy as Fulbright season makes me in February, I still look forward to April and May, when we will find out the results of the applications that students started last February. I have my fingers crossed for them, and I will be ready to cheer, both for those who eventually receive Fulbright scholarships, and for those who do not. We have very high hopes. 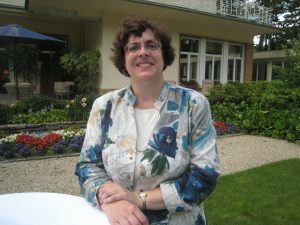 Since 2004, thirty-one Hope College students have won and have accepted Fulbright scholarships. We are always looking for new candidates. If you are a current Hope student or an alumnus/a, you could be one of them. It’s February—time to start for next fall’s application deadline. If you are interested, please contact me (gibbs@hope.edu) or Professor Cunningham (cunningham@hope.edu) right away. It’s not too late, if you start now. Who knows where you’ll end up? It’s a big world. And send me a postcard when you go—I’ll put it on my door to remember you by.